Brock’s Performance is proud to announce it will be renewing it’s sponsorship of the Rickey Gadson Drag Racing School for the 2013 race season. 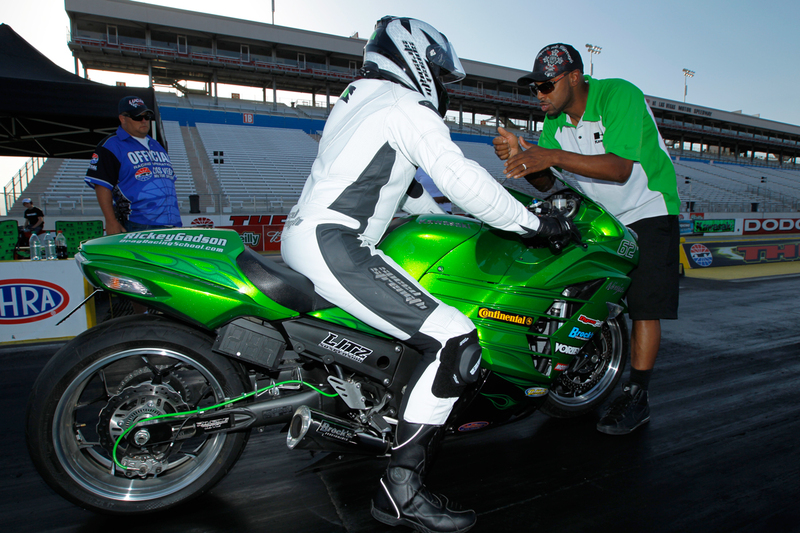 The Rickey Gadson Drag Racing School holds classes from New Jersey to Texas. Personally taught by 10 time champion drag racer Rickey Gadson, the school offers two-day beginner classes and one-day advanced classes. Started in 2006, the Rickey Gadson Drag Racing School offers training in not just racing, but general riding techniques for the street rider. Brock’s Performance will outfit the school’s fleet of ZX-14Rs with race equipment including full exhaust systems, front end lowering kits, clutch mods and rear suspension ‘Window Links’. About Brock’s Performance: Brock’s Performance leads the way in sportbike innovation for acceleration addicts. From exhaust systems to wheels, this championship-winning company designs, builds and sells more than 3000 products that make it easier and safer for racers and street riders to reach record-breaking results through a never-ending process of research, development and track testing. For more information about BST wheels and other Brock’s Performance parts, go to BrocksPerformance.com. About The Rickey Gadson Drag Racing School: The Rickey Gadson Drag Racing School was founded in 2006 and has helped to shape hundreds of drag racers around the world. Rickey uses his 28 years of drag racing knowledge and proven performance on the track to train people who want to learn to race properly, safely, and be successful in motorcycle drag racing. Gadson’s past students have improved their skills and posted their best personal E.T record during the school. For more information about Rickey and his school, go to RickeyGadsonDragRacingSchool.com.